Amit Wadhwani, today, is one of the names to reckon with in Mumbai real estate. His career trajectory is a testimony to the power of dreams and determination. Director, Sai Estate Consultants, Amit is the driving force behind the steep growth of this small time real estate broking firm to an ISO & CRISIL certified organisation. With an aim to redefine brokers and broking industry in the minds of the consumers, Amit is surely making heads turn in one of the most dynamic industries in the country. Benefitting from his hospitality background, Amit created a differentiation for himself just by treating the customer differently. Today, he not only leads a team of young, driven and high energy sales consultants but also manages a sales turnover of Rs. 2000+ crore.] It is one of the first Consultant to be registered under RERA. Amit Wadhwani has played a key role in making Sai Estate Consultants a force to reckon with. Amit leads the sales endeavor at Sai Estate Consultants. He has ensured SEC has grown at a frenetic pace, from a TEAM of employees (50+ IIMs). Amit started with just a couple of people in his team back in 2010. He now commands a team of nearly 200 people and by 2019, he plans to float public issue, grow to a 500-member team and have an office each in 30 countries. 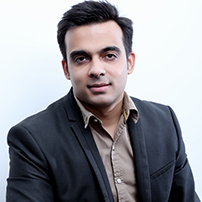 Cutting his teeth in secondary real estate market, Amit’s in-depth knowledge of customer needs has paved the way to tie up with international markets too. For the past few years, investors have been reaping the benefits of portfolios curated to their specific requirements while end users are wide-eyed with disbelief due to the sheer variety of choices offered; all under the watchful eye of SEC which addresses all of their primary concerns – such as quality of construction, delivery timelines, payment schedules etc, the moment they walk in through the door. He gets extensively quoted within lead stories across Times Group, Magic Bricks, CNBC amongst others where he talks nos. on sales, requirement, buyer behavior, myths, boons etc. ‘Sai Estate Consultants’ (SEC)– 1st ISO 9001 Certified & CRISIL Rated channel partners for both outright & leasing cases with emphasized focus across Mumbai and Delhi. The organization has built a reputation of being one the most reliable and trustworthy channel partners for all 60+ developers SEC works with.